We’re celebrating 25 years of serving Italian-American cuisine to the people of Des Moines and the years have zipped by. If you’ve been to our South Union restaurant, you’ve seen all of the photos on the wall documenting our history but you may not know all of it. We’ve said it before and we’ll say it again: you’re home when you’re at Baratta’s. That’s not just a saying—you really are in a home when you’re here! In fact, that’s how Baratta’s started! The original Baratta’s grocery store. Baratta’s actually began as the Berard family home. Before ultimately selling the house to the Barattas, they raised a large family in the home, establishing what would become a lifetime of love in the building we call home. In fact, just last year, members of the Berard family rented a bus to tour the south side area, then finished with a big family dinner at Baratta’s! The original proprietor, Charlie “Cat” Baratta. After purchasing the home from the Berards, in the 1950s, the Baratta family built a grocery store—albeit, a small one—in front of their house. The store specialized in traditional Italian ingredients and food. Success came quickly and Des Moines residents came to know that if you wanted that old world flavor in your dishes, you went to Baratta’s. As popularity grew, the family connected the store and house. Eventually, the store slowly took over the Baratta house and Grandma Baratta’s living quarters got smaller and smaller. In fact, she ended up in what was more like an apartment in what’s now the upper party room! We joke that when funny things happen, it’s Grandma Baratta playing tricks on us. Joe and Lisa in the early days of Baratta’s. Years before becoming business partners, Lisa Kruger and Joe Gatto met in a trigonometry class at Lincoln High School. They formed a friendship and ended up working for a local Italian restaurant, where they got their first taste of what it takes to work in the food industry. Mike and Marge Baratta (Mike was Charlie’s brother), who sold us Baratta’s. When 1993 rolled around, Lisa and Joe purchased the store from the Baratta family and turned it into a restaurant. Being lifelong southsiders, they knew how important it was to stick to the store’s Italian roots, so the menu wasn’t flashy and stuck to the classics. In a twist of fate, when it came time to name the restaurant, Lisa and Joe found out that the “Baratta’s” sign was too expensive to move or change, so they decided it was easier to keep the name! Joe helping out at a catered event at the State Historical Building. Seven years after the restaurant opened, we started offering off-site catering services. Joe and Lisa saw the opportunity to bring the food customers loved straight to their customers. We began catering public events, corporate luncheons, private parties, and more, eventually offering dinner delivery of our full dinner menu to the south side of Des Moines. After often teaming up successfully with the State Historical Building, a partnership began. Baratta’s Catering vans getting ready to roll out. When the folks at the State Historical Building started looking for a team to take over their café space, Baratta’s was top-of-mind. Since 2005, Café Baratta’s has been at home on the third floor. At that point, the catering business had grown and it was the perfect time to expand. Monday through Saturday, lunch is served in the café, which also opens up to a beautiful terrace. Café Baratta’s before the lunch rush. A couple of our wonderful customers enjoying lunch on the terrace. Teaming up with the Iowa Arts Council, Baratta’s began Tunes on the Terrace. Each Friday in May, June, and July, local musicians play a live acoustic set while customers take their lunch break. It’s a fun way to learn more about local artists in a peaceful setting. A Yankee Doodle Pops party on the Grand Terrace. The partnership with the State Historical Building has been seamless and we couldn’t be happier with how each and every event there turns out. Not only is the venue absolutely stunning, it’s full of multiple spaces available to rent—including the Grand Terrace, overlooking the East Village. View of downtown Des Moines from Forté. 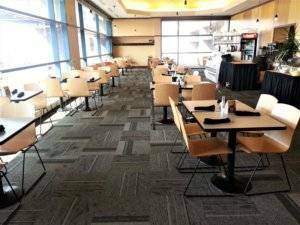 Five years after opening Café Baratta’s, in 2010, Baratta’s took over the banquet services at Forté Banquet and Conference Center. The event center can fit up to 750 and has since become home to everything from comedy shows to elegant weddings. All catered by Baratta’s, of course! Zoobilation at the Blank Park Zoo. The most recent partnership for us has been with the Blank Park Zoo. In 2016, we began working as their exclusive caterer. Since then, we’ve catered weddings, birthdays, and more. One of our favorite events to cater is Zoobilation, a fundraiser supporting educational programs, veterinary care of the Zoo’s animals, conservation efforts, and educational programs. This year has been full of changes. Our new website makes it easier to find our menus and events coming up. Not-to-mention all of the changes at the restaurant! Our dining rooms have gotten facelifts and the new bar now has booth seating (just in time for our new happy hour specials). What will never change is our dedication to you, our customer. Whether you’re new to the Baratta’s family or were there from the beginning, we hope you’ll join us in celebrating at our anniversary party on Tuesday, June 12th, from 4-5:30pm. We’ll be serving appetizers and drinks, so feel free to bring the family and stay a while!